Having overthrown Roger Mortimer and established himself as the ruler of England, Edward III was keen to demonstrate his military credentials and did so in spectacular fashion at the Battle of Halidon Hill (1333). Here he decimated a larger Scottish army experimenting with tactics he would later use at Crécy. The first War of Scottish Independence was still raging when Edward II of England was deposed in 1327 by Roger Mortimer, Earl of March. The war had been going wrong for the English since the death of the warrior King Edward I in 1307 but following the catastrophic defeat at the Battle of Bannockburn (1314) a state of almost perpetual war had existed in Northumberland. Despite being militarily ineffective, Edward II refused to negotiate a truce but, once overthrown, Mortimer sought peace and compelled the new English King, Edward III, to sign the Treaty of Edinburgh-Northampton (1328) ending the first War of Scottish Independence. Peace didn’t last long though; in 1330, Edward III engineered the downfall of Mortimer and took substantive control the Government. His attention turned towards Scotland and his Grandfather’s plan to make it a vassal Kingdom. The death of Robert I (the Bruce) of Scotland in 1329 afforded him the opportunity to resume the war. Robert had died leaving his seven year old son David (II) as his heir and Edward saw an opportunity to overthrow this child monarch. In 1332 he covertly supported the claim of Edward Balliol, son of the former King John of Scotland, over and above David. Balliol was crowned but he was deposed a few months later and fled to Carlisle. He requested support from Edward III and pledged to cede Berwick-upon-Tweed to the English King. Edward took up the challenge and moved his army north. 3. Inserted a force of at least 200 soldiers into the town. The Scottish army was around 14,000 strong versus around 10,000 English. However the latter were well equipped. Douglas delayed taking any action until the 19 July 1333 - the very last day before the agreement between the English and Seton expired. The Scottish force initially drew up on the higher ground, the Witches’ Knowe, immediately to the north of Halidon Hill. This was a strong position but the onus was on the Scots to attack; Edward would win just by remaining stationary. To fight the English, Douglas would need to lead his forces downhill, transit through boggy ground and then ascend Halidon to attack the English position. It was an unenviable task but he had more troops and, in the immediate term, only needed 200 soldiers to ‘break through’ the English lines and reach Berwick. 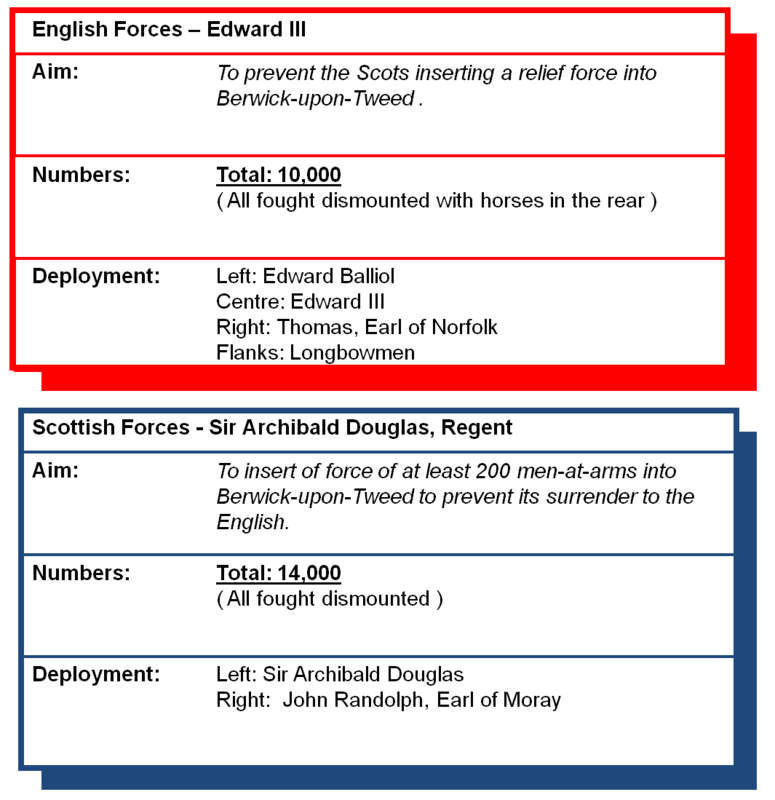 Douglas configured his forces into three densely packed formations of spearmen (a repeat of the schiltrons so effectively used at Bannockburn). All personnel were dismounted with the horses retained at Witches’ Knowe. 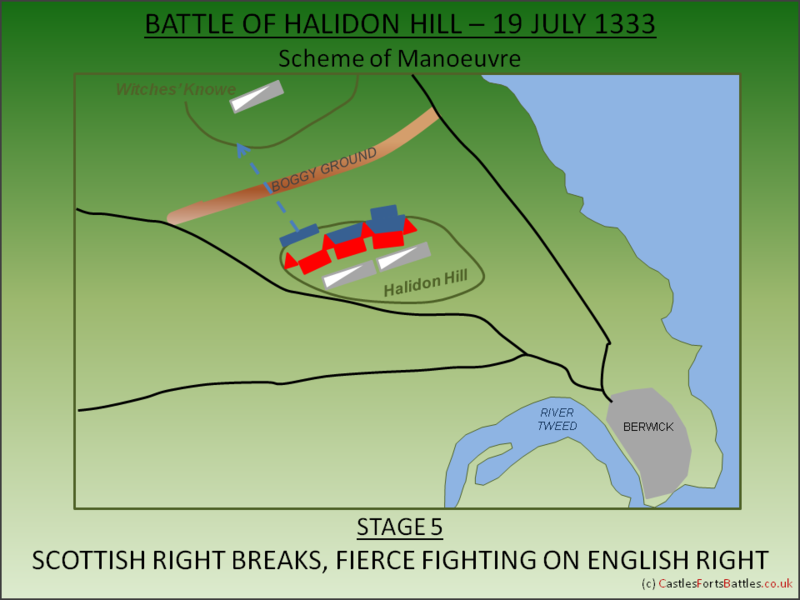 In response the English, having left a sufficient force to sustain the close siege of Berwick, moved to occupy Haildon Hill which was the highest ground immediately to the north of the town. By controlling this position they commanded all road access to Berwick and any advancing force would have to fight them to gain entry. Accordingly Edward drew up his army in a defensive formation; three divisions of infantry were each flanked by archers who were arranged in a projecting wedge allowing a withering crossfire to be delivered against advancing forces. All personnel were dismounted and the horses kept to the rear. The battle seems to have commenced around midday with a challenge of single combat; a ‘giant’ Scotsman called Turnball fought but lost to a Norfolk Knight, Robert Benhale. Following this, the Scottish forces then began their attack with all three schiltrons descending from Witches’s Knowe and entering the bog that separated them from the English position. The muddy ground slowed the advance of the Scots and made them an easy target for the English archers who started their deadly barrage. As the arrows hit home at speeds of around 90mph, casualties amongst the Scottish ranks mounted. Despite the hailstorm of arrows the Scottish forces pressed on. It was the Scottish right, under the Earl of Moray, who were first to connect with the English ranks – having seen Edward Balliol’s banner on the left of the English line they pushed hard to it. But they suffered heavily from the archer’s assault with contemporary writers describing that many “turned their faces away” from the hailstorm of arrows. Whatever force finally made it to Balliol’s men-at-arms was quickly broken. The central divisions of the Scottish army fared little better. Running the gauntlet of the archers they sustained huge casualties before meeting the forces directly under Edward’s command. The Scottish left, under Sir Archibald Douglas himself, seems to have included additional men; either incorporated into the main division or as a fourth group. It is most likely these were the contingency; if the Scots failed to overwhelm the English, these are the men that would break-through and arrive at Berwick to augment the garrison and satisfy the agreement between Edward and the town. Fierce fighting ensued but, as casualties mounted, the remaining Scottish troops broke into rout. The Scots fled downhill with the nobility hoping to get back to the Witches' Knowe to mount their horses and escape. However the dismounted English Knights now left their infantry positions, mounted their own steeds and charged the fleeing Scots. It was a total rout with vast numbers of Scottish troops, nobility and commoner alike, killed. Those Scottish Knights who made it back to Witches’ Knowe found their aides had fled with their horses leaving them to their fate. Casualties have been widely exaggerated by chroniclers but likely accounted for the greater part of the original Scottish force. Halidon Hill was a decisive English victory that left Berwick in English hands and Scotland defenceless. But Edward’s ambitions were in France and he did not consolidate his victory with a full scale attempt to subdue the Scots; Balliol’s government was never accepted and in the longer term Halidon Hill simply marked a successful start to an ultimately unsuccessful strategy. However, in a wider context, it was also the first battle fought by Edward III and proved the effectiveness of the English Longbow and dismounted men-at-arms; a configuration he would use to great effect at the Battle of Crécy (1346) and which later would be repeated at the Battles of Poitiers (1356) and Agincourt (1415). Lancaster, J.H.D (2014). 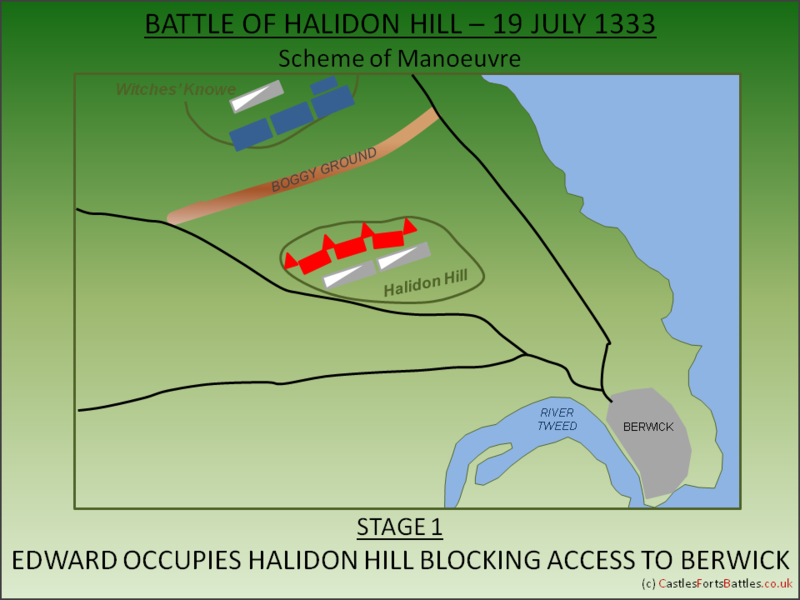 Halidon Hill: Battlefield visit notes and observations. CastlesFortsBattles.co.uk. There is a small monument on the roadside and a plaque in the car park. The battlefield walk offers the visitor good access to battlefield enabling the dominant position of the English to be fully appreciated. View from the English Position. The Scots advanced from the Witches' Knowe - the high ground in the picture above. Berwick-upon-Tweed. The battlefield dominated the approach to Berwick-upon-Tweed.